The mining concession for the Gavião deposit is 100% owned by EDM, SA. On 5 July 2012, a consortium agreement was signed with Almina – Minas do Alentejo, SA to develop the project and determine the economic viability of the operation of the Gavião deposit, thus sharing the risks associated with past (EDM) and future (Almina) investments. The mineralization of Gavião is divided into two main masses. The SW mass consists of a single stratiform body in a NW-SE direction with an 80º inclination to the NE, and is cut in the NW sector by the Main fault, displacing its NW branch to the N. The SW mass has an average apparent thickness of 35 m and a minimum length of 800 m. The boundaries of the mass to the NW to the SE and its depth, which reaches a minimum of 650 m, are unknown. 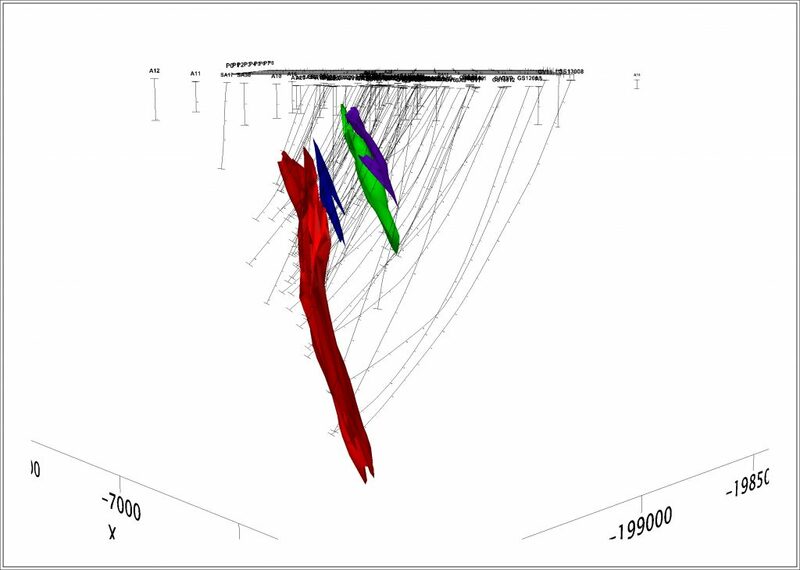 In the last probing campaign (EDM-ALMINA Consortium) there was an update (intersection of probing GS13008) of the depth with a 75-m increase in apparent thickness to 37 m.
The NE mass consists of several lenticules of sulphides (around 5) with variable thicknesses in directions and inclinations similar to the SW mass. The discovery of the Gavião deposit in 1970 was a novelty in the Portuguese mining industry, and a precursor to the increased potential of the “Portuguese” pyrite belt that has been observed. It was a first sign of what is yet to develop in this metallogenic province, proven thereafter until the present situation. 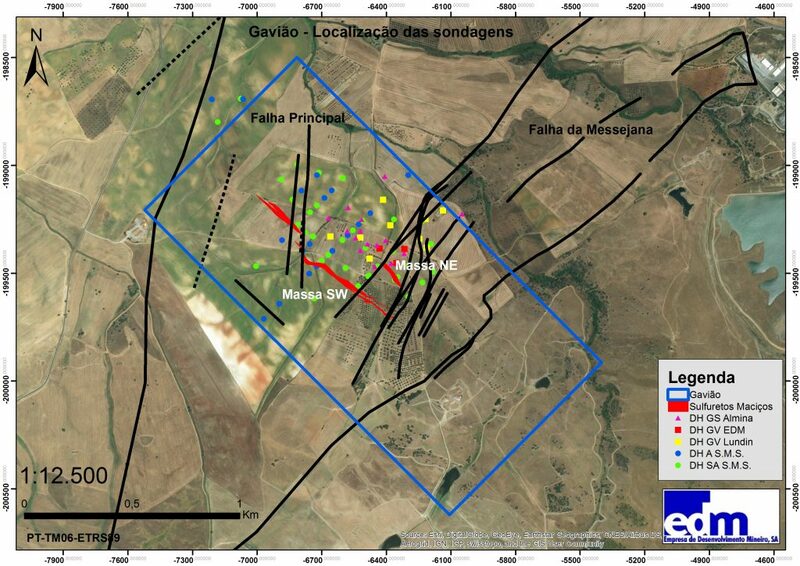 This deposit was identified in the area of Aljustrel through 62 probings (a total of 19,555.34 metres drilled), by the then Sociedade Mineira de Santiago SMS, the predecessor of EDM. 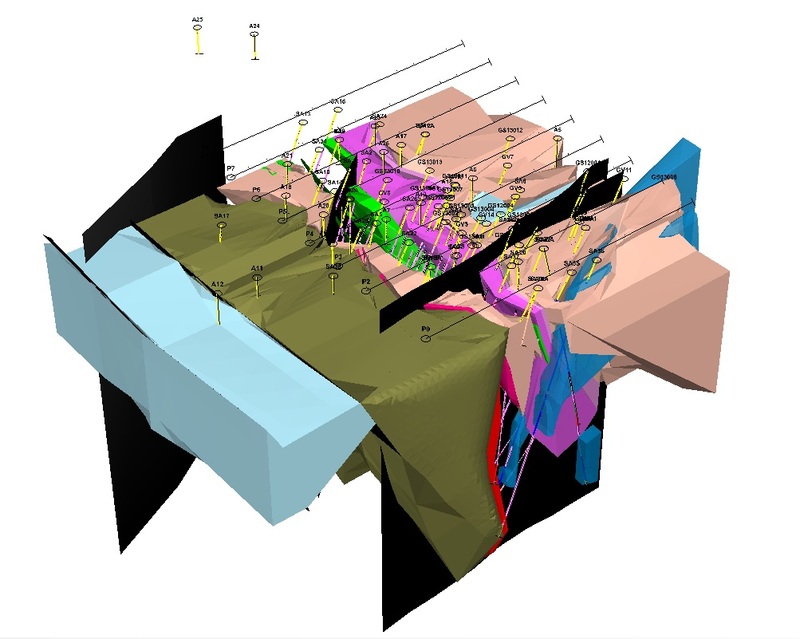 Numerous mining exploration works were carried out in this area, in particular various geophysical survey campaigns (gravimetric, electromagnetic, magnetic and electric analysis), geochemical surveys and various drilling campaigns, most importantly those held in 2012 and 2013, together with Almina, which increased the degree of confidence with regard to the distribution of content and the extent of mineralization at depth. So far a total of 101 drilling surveys have been carried out, with 37,764.29 metres drilled. The geological sequence of the Gavião is interpreted as corresponding to the continuation of the mineralized Algares-Moinho-São João volcanic axis to the NW of the Messejana fault, having been rejected by this structure to the SW. The mineralization of the Gavião forms part of the geology of the Aljustrel region and is characterized by the same major lithostratigraphic units of this area, and which are also known widely in the Iberian Pyrite Belt (IPB). The IPB is one of the most important metallogenetic provinces in the world for deposits of base metal massive sulphides associated with volcanic and sedimentary rocks, extending between Grândola and Seville, along a strip around 250 km long and 60 km wide, which equals an area of approximately 12,500 km2. Phyllite-Quartzitic Group (PQ) – (Middle Devonian – Upper Devonian) is represented by a sedimentary sequence consisting of phyllites and quartzites at the top, with local levels of limestones and siltstones. Volcano-Sedimentary Complex (CVS) – (Upper Devonian – Middle Carboniferous) consists of a bimodal volcanic sequence of several acidic volcanic units, of an effusive and explosive nature, and in lower number, of basic units. These volcanic rocks occur interspersed in a sedimentary sequence of varying composition where various geological formations are individualized. The massive sulphide mineralizations occur associated with the acidic volcanic rocks and black shales occurring in the vicinity of these volcanic centres. On the units of the IPB the Flysch do Baixo Alentejo group occurs, which in the Gavião zone is represented by the Mértola formation (Middle Carboniferous) this being formed by a turbidite sequence consisting of shale, greywackes and some conglomerates. The geological units of Paleozoic age were subjected to tectonic forces that originated sequences of tight anticline and syncline folds lying in a NW-SE direction and vergency to the SW, sometimes presenting rupture of the inverse flanks and overthrust and/or transport of sediment load. The mineralized sulphides are affected by this folding and may also be transported or overthrusting more recent geological units. In the Aljustrel sector, all these geological units have also been fractured by the Messejana Fault, in a NE-SW direction, which caused a throw of around 2.6 km to the SW, and also the subsidence of its block to the NW. This block is currently covered by tertiary and recent deposits consisting mainly of conglomerates, clayey sandstone, sand and gravel. In fact, this fault corresponds to an area where there are several parallel faults and it has as a conjugated system of faults in a N-S direction with movement of direct separation, of which we highlight the Represa, Castelo and Cerro Calvo fault. Geophysical surveys of the “Mise à la Masse” kind show the existence of an electrical conductor with a NW-SE orientation, which coincides generally with the position of the SW mass. This conductor extends to the NW of the mineralization known through probings suggesting that this may extend in that direction and also to the SE, towards the Messejana fault, arching to the E in the proximity of the structure. This camber is in line with the counterclockwise movement of the Messejana fault, similar to what happens with the mass of São João in another block of the same fault. The NE mass is also correlated with a conductor evidenced by the same method, which suggests the continuation of this mass to the Messejana fault, which may correspond to the mineralization intercepted in the SA25A probing. The mineralization of the Gavião consists essentially of pyrite with different proportions of chalcopyrite, sphalerite and galena. Other sulphides also occur in lesser amounts, such as arsenopyrite, tennantite-tetrahedrite and pyrrhotite. The mineralization generally has a fine to very fine-grained texture and is associated with acid volcanic rocks, called Tufo de Mina and with black shales of the Gavião Formation.